[2011 May] Adverse reactions lead US patients to ask 'just how safe are antibiotics?' he was prescribed a toxic combination of drugs to treat lingering symptoms of what his doctor thought was prostatitis. Ten years later, he suffers from permanent brain damage, is on disability and has lost more than $3 million in medical costs and income. Grozier was prescribed a combination of ciprofloxacin and vioxx, a nonsteroidal anti-inflammatory drug. 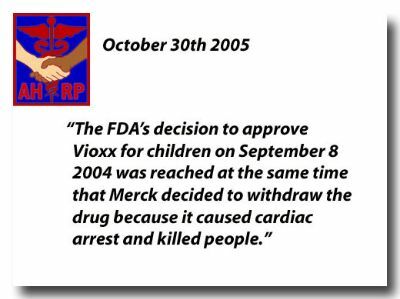 Vioxx/David Graham he identified the FDA’s handling of Vioxx as the worst public health disaster in its history, resulting in a probable 30,000-55,000 deaths of Americans alone. 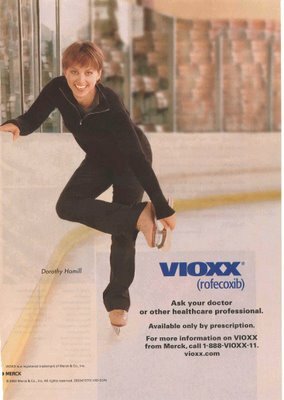 [2009 June] Publisher consulted drug firm on journal content THE world's largest medical publisher (Elsevier, which produces The Lancet) asked the manufacturers of anti-inflammatory drug Vioxx which articles they wanted to include in a so-called medical journal on bone health.....The plaintiff in the class action has alleged the journal was fake and it was simply a marketing exercise designed to promote Vioxx. The court has also heard Merck put the names of high-profile arthritis experts on the editorial board of the phoney journal without telling them they had done so. [2009 April] Vioxx maker Merck and Co drew up doctor hit list "We may need to seek them out and destroy them where they live," a Merck employee wrote, according to an email excerpt read to the court by Julian Burnside QC, acting for the plaintiff. [2009 March] Top Pain Scientist Fabricated Data in Studies A prominent Massachusetts anesthesiologist allegedly fabricated 21 medical studies that claimed to show benefits from painkillers like Vioxx and Celebrex, according to the hospital where he worked. Pharmaceutical giant Merck & Co Inc. had evidence by 2000 that its painkiller Vioxx, which was pulled off the market on Sept. 30, was not safe, a heart specialist told CBS News program "60 Minutes" on Sunday.